In this sweet little film, a boy-like minstrel and his misshapen dog disturb a nobleman in a castle. The nobleman destroys the minstrel’s lute, whereupon a little bird gives the boy a magical flute, which makes alle people dance, including the evil nobleman and his birdlike soldiers. This pantomime story is elaborately animated, but its designs belong more to the thirties than to the forties, and its story is hampered by uneven timing. 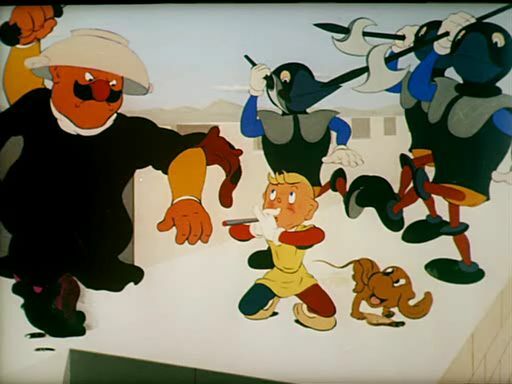 The idea of a flute making people dance was reused twelve years later by Belgian comic artist Peyo in his ‘La flûte à six schtroumpfs’ introducing his famous creations, the smurfs. This was also made into an animation film in 1976.